Ken and Barbie played a role in the 2010 hit movie Toy Story 3. 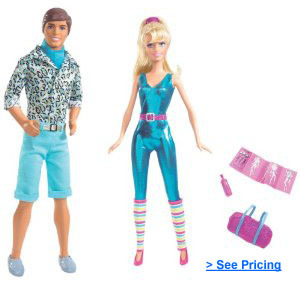 Now your kids can play with this Ken and Barbie inspired by their role in the movie. They’ve been sweethearts forever and now they can be yours too! Ken and Barbie’s long time love affair was recently played out in Pixar’s Toy Story 3 movie. They are a great pair to compliment any play time with and would love to be apart of your child’s fun! This timeless couple can be a part of your child’s everyday play for a long time to come. Some people have mentioned that the product photos are misleading, so please note that this product does not come with the accessories. This comes with just the Ken and Barbie Doll. Recommended for ages 3 year old and up. If you love Toy Story 3, you may also want to check out our List of the Best Toy Story 3 Toys from the Movie or our list of LEGO sets from Toy Story 3.